For the last three years I have been using the micro-blogging application Twitter to send out little “tweets” about a few of my daily activities and thoughts of the moment. Over that time, I have published over 750 messages and have found “tweeting” to be both a useful and challenging experience. One of the first things that any Twitter user learns is that they are restricted to writing only 140 characters or less at a time. For someone who is in the habit of teaching 50-minute classes here at NBBI, this task is most difficult. It has forced me to get to the point. As one preacher put it, “When you have limited time you can’t fly the airplane in circles looking for a spot to land.” Tweeting has helped me say more using fewer words. Another use I have found for Twitter is to send timely messages inviting people to meetings, updating followers on our travels and passing along urgent prayer requests. For example, last year, while a group of us were evangelizing on the streets of Halifax, NS, we had an encounter with a heckler whose hatred for God was seen when he spit on a copy of the Ten Commandments. As this young man continued on down the street, ranting against the Lord, I sent along a quick message asking people to pray for him. Ten minutes later he humbly came back and expressed regret for his actions. He ended up talking with us for some time and gladly received a book explaining God’s plan of salvation. Finally, my Twitter experience has been inwardly reflective. It has given me the opportunity to look at what is worth sharing with the world and what would be better left unsaid. 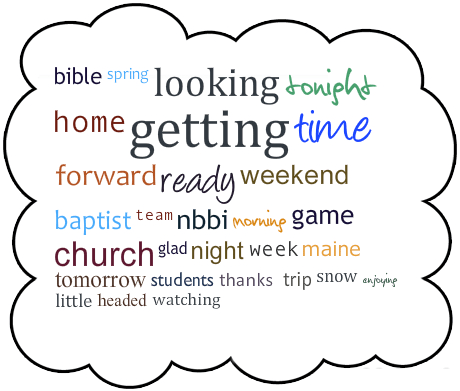 Recently, I filtered all my tweets through an online tool called Tweet Cloud. It came up with my most used words and placed them in the image printed with this article. Although this is only a small snippet of my life, I cannot help but think about all the things we do and say throughout our days. It is a solemn reminder that God keeps track of even our “idle words” and someday we will account for them. May our conversation be such that it glorifies Jesus Christ in all things. You can follow me on Twitter @jackcaron in 140 characters or less. Great article on tweeting. I am going to use it to teach kids about the positive use of this medium in my English class next year. Thanks! Following the King in the Land of Shiny Things from stickyJesus on Vimeo.